The ISO 55001 standard guides businesses to control and manage the life-cycle of an asset. Depending on the type of the asset, the life-cycle of assets goes throughout different stages such as acquisition, construction, operation, and maintenance. The ISO 55001 standard guides businesses to control and manage the life-cycle of an asset. Depending on the type of the asset, the life-cycle of assets goes throughout different stages such as acquisition, construction, operation, and maintenance. Hence, ISO 55001 can be applied to all sizes or businesses and all types of assets. Organizations that have adopted ISO 55001 realized huge benefits after its implementation. The standard will help towards the boost of organization's efficiency and effectiveness of the system and most importantly reach objectives by focusing on risk and cost. 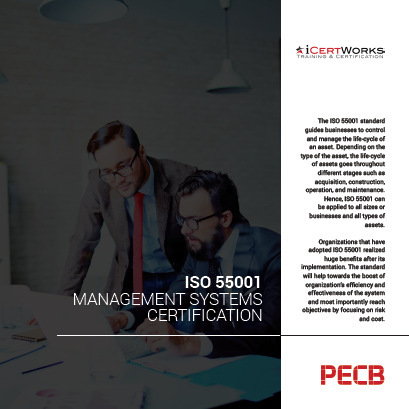 ISO 55001 certification (also known as "registration"), is a third-party audit performed by a certification body such as PECB who, upon verification that an organization is in compliance with the requirements of ISO 55001, will issue an ISO 55001 certificate. This certification is then maintained through regularly scheduled annual surveillance audits by the registrar, with re-certification performed on a triennial basis. For more information on ISO 55001 Certification, please fill out the form on the right side of the page. Contact us about ISO 55001 Certification!